1) I loved Billy B’s apple beer from Thorogoods…the second time I had it. The first time, they sent me a few bottles and I didn’t find it very nice at all. A few years later Luke and Dave from the Ale of a Time podcast and Phil and George from the Beer Diary podcast starting banging on about Billy B’s. So I thought, “what have I missed with that beer?”. I ordered a bottle, tried it and loved its tasty, beery, tart characters. What had happened was my taste buds had developed enough to be able to understand and appreciate the beer. 2) I stopped in at First Choice Liquor on the way home from work one day. I usually don’t bother with First Choice because, compared to Dan Murphy’s options, the beer range never changes. It’s always the same stuff. 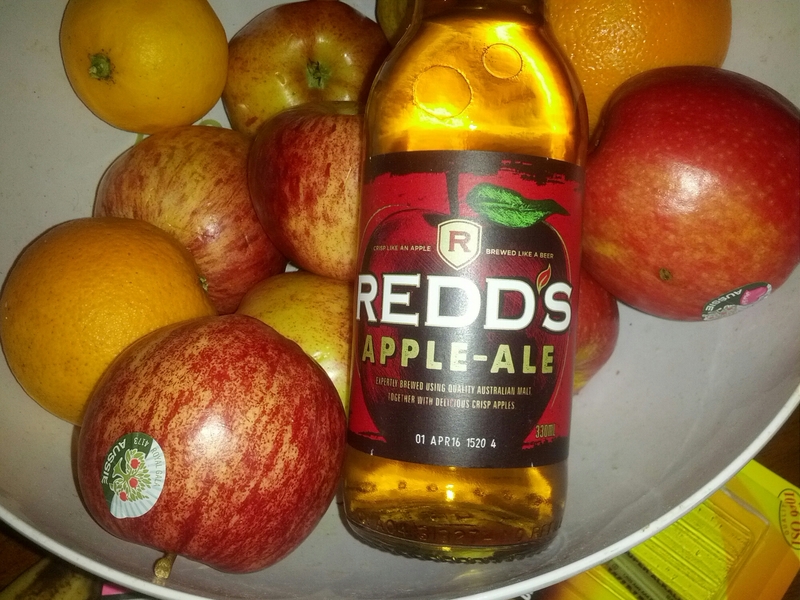 I was just about to leave empty-handed yet again when I spied Redd’s Apple Ale, a beer I had never heard of. It had apples in it so I thought it may be a more easygoing version of Billy B’s. So I bought a six-pack of it. 3) It’s made in Australia by CUB but a bit of googling told me the idea came from the States, where Miller-Coors makes Redd’s Apple Ale. And it didn’t impress the beer geeks – it gets single-figure ratings on those geekified beer websites. 4) But I still had hopes for this beer. And they looked like paying off at the start. The first few mouthfuls gave me some sharp apple notes with a malt backbone. But the more I drank, the sweeter it seemed. Also, it started to seem like there were two separate drinks here – a beer and a cider – rather than one combined effort. Halfway through the glass I had to tip it out because it started to taste like a shandy or a radler. I’d suggest it’s a product marketed at those currently drinking super-sweet ciders and RTDs. 5) Frozen Summers suggested to me that he feared Redd’s could be a way for CUB to offload more Carlton Cold and Mercury cider. And I have to say he might be onto something. My initial impression of the packaging was that the beer was brewed with apples, but the writing never specifically states that. It says “Expertly brewed using quality Australian malt together with crisp Delicious apples”. Perhaps I’m splitting hairs but the use of the word “with” rather than “and” implies the apples weren’t included in the brewing process. But the wording is so clever that, unless you thought about it, you’d assume the apples were among the fermentables in the brewing process. They might still be – I could be off-base here. But it really does taste like a beer that’s had cider mixed in with it post-brewing. Free or paid for? : It was bought. A whole damn six-pack’s worth.